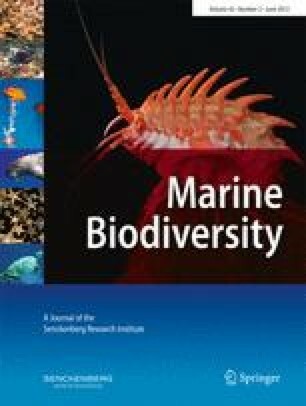 DNA barcoding revealed four well-supported clades among amphipod specimens that keyed out to Epimeria georgiana Schellenberg, 1931, three clades with specimens from the southern Scotia Arc and one clade with specimens from the Weddell Sea. Detailed morphological investigations of sequenced specimens were conducted, through light and scanning electron microscopy. High magnification (500–2,000 fold) revealed features such as comb-scales on the first antenna and trich bearing pits on the fourth coxal plate to be similar for all specimens in the four clades. Consistent microstructure character differences in the Weddell Sea specimens combined with high genetic distances (COI divergence > 20%) allowed the description of Epimeria angelikae, a species new to science. Specimens of E. georgiana in the other three COI clades from the Scotia Arc were morphologically indistinguishable. Representative specimens of clade A are also illustrated in detail. Our results on the high genetic divergences in epimeriid amphipods support the theory of the southern Scotia Arc being a centre of Antarctic diversification. We are grateful to the team at the Canadian Centre for DNA Barcoding (supported by Genome Canada through the Ontario Genomics Institute) for providing they sequences for the CAML project. Angelika Brandt (Hamburg) kindly let the senior author use her microscope. Renate Walter (Hamburg) helped with the scanning electron microscopy. Erika Mackay (NIWA) kindly inked the drawings. Niamh Kilgallen (NIWA) and three anonymous reviewers are thanked for constructive criticism on an earlier version of the manuscript. The Natural History Museums of Stockholm and London are thanked for the loan of type material. The curational help of the NIWA Invertebrate Collection (NIC) team is highly appreciated. A.N.L and P.S were supported by research funded by the New Zealand Government under the NZ International Polar Year-Census of Antarctic Marine Life Project, and gratefully acknowledge the Ministry of Fisheries Science Team and Ocean Survey 20/20 CAML Advisory Group (Land Information New Zealand, Ministry of Fisheries, Antarctica New Zealand, Ministry of Foreign Affairs and Trade, and National Institute of Water and Atmospheric Research Ltd.). K.L. was funded by The Natural Environment Research Council. D.S. was supported by funding of the Alfred P. Sloan Foundation to MarBOL. This study is part of the British Antarctic Survey Polar Science for Planet Earth Programme and the NZ International Polar Year-Census.